Quebec’s budget deficit has been the justification for the deep funding cuts and tax hikes implemented by the Couillard government in the past year. Among its many targets, this austerity program slashes hundreds of millions from education subsidies, public-sector jobs, and the healthcare system, in addition to raising the monthly fee for provincially-subsidized daycare. Austerity is harming the lives of Quebec’s citizens and students, and we need strike action to fight it. Reductions in education spending have already lowered the quality of Quebec’s schools and universities. Here at McGill, budget constraints have meant delays to much-needed infrastructure repairs, reductions of TA salaries, and hiring and salary freezes for faculty members. This is already affecting the university’s teaching and research capabilities: class sizes have increased, and research opportunities have dried up. Failing to invest in education (a public good that contributes to society) damages Quebec far more than an unbalanced deficit. 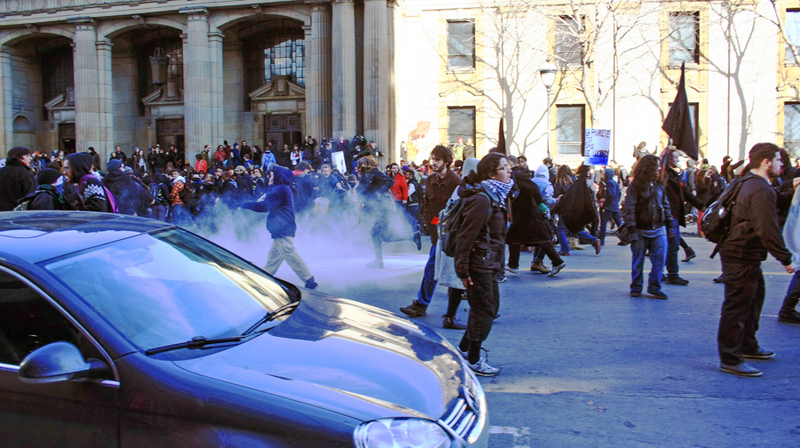 Still, while students are affected, austerity measures hit marginalized groups the hardest. Ironically, as our province begins to fail to provide adequate opportunities for its citizens, it will find itself in a devastating race to the bottom. It’s time, as it was for students in 2012, to strike. More importantly, it’s time for a general strike: for workers and students to unite in fighting back against damaging cuts. You only need to look at Greece’s dramatic decline for evidence that austerity doesn’t work. It punishes the poor in order to protect the interests of the rich. Many in Quebec realize this, and are demanding a reduction in the cuts. But simply asking the government nicely has not worked. Petitions, and consultation with various commissions, as well as protests by unions and elected officials have all done nothing to prevent this government from slashing funding. Opinion pieces and editorials in newspapers and media outlets haven’t done anything either. As far back as last summer, organizations throughout the province, from unions to universities, have called for local strikes. This winter and spring however, a number have banded together under one movement: the Printemps 2015 committees. Together, they are dedicated to mobilizing support, and eventually calling a strike. McGill joining the strike would be a gesture of unity with the millions of people affected in our province, as well as a necessary and effective move for our university’s future wellbeing. This spring will be a crucial moment for this movement. It’s a time when many local unions and organizations, including police officers and social workers, are due for contract renegotiations with the government. Add to this the increasing frustration across the province due to extensive cutbacks. As a target of these cuts, but more importantly, as an integral part of Quebec and Montreal society, McGill should also join this growing voice of dissent. Only through solidarity and unity can a general strike be effective, and only then might the government change tack. McGill joining the strike would be a gesture of unity with the millions of people affected in our province, as well as a necessary and effective move for our university’s future wellbeing. Most importantly though, strike and protest actions work. A history of massive mobilization to address social issues or change government policy has existed in Canada since the 1919 general strike in Winnipeg. And they have worked, overwhelmingly so, in many other cases. With increasing frustration and resentment, the provincial government is particularly vulnerable to work stoppages and protest. There is every reason to believe in the power of a general strike. Quebec has been hit with hard times. A government bent on austerity has done everything in its power to cut funding where it can: from cities, schools, and unions. It’s time to reverse the damage being done to our communities, and for McGill to join the rest of the province: to strike. To contact Daniel Huang, the writer, please email to commentary@mcgilldaily.com.